It’s March, which means Saint Patrick’s day is around the corner, with all the hoopla that has become associated with it here in America. They say confession is good for the soul. So here we go…. For almost anything in life, I don’t judge other people for what they enjoy doing. If you’re into it, it’s your life, and as long as you’re a contributing member of society, I feel you have the right to what ever you want to in your free time. Oh don’t get me wrong, I might raise a Spock eyebrow in a “really?” type manner, but it’s not overly critical, or judgmental, because I know that people do it to me as well for things that I enjoy doing. But sadly that mantra is impossible for me to maintain when it comes to Saint Patrick’s day. 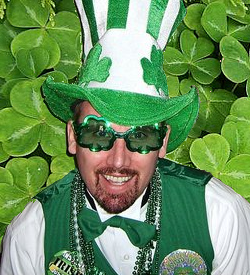 You see when it comes to Saint Patrick’s Day, my attitude was shaped by a man who lived with a college friend of mine back in the early 80s. This man, Brian, was an Irish national who worked for Phillip Morris and I spend much of my college time in his presence, learning about his country, soaking in his love for his culture, and yes, even sometimes slipping into his brogue when we spent to much time together. I spent many a Saint Patrick’s in his presence, watching him celebrate the day the way he thought it should be celebrated, enjoying traditional music throughout the day, enjoying a hearty meal, catching a parade if you wanted. He made sure to always have a bottle of Jameson open in case friends came to visit, and more importantly, he always brought one when he was the visitor. But during these celebrations I didn’t realize that a form of cultural programming was occurring that now deters me from joining others in the yearly rituals that have become associated with how we celebrate Saint Patrick’s Day today here in America. Somewhere along the way Brian planted the equivalent of a post hypnotic suggestion or the Irish equivalent of the ol’ McJedi Mind Trick, that lingers to this day, that if I could sum it up simply would be…. You seem to be enjoying yourself as you drunkenly shout “ERIN GO BRA-LESS” around the bar, as if hoping there’s an Erin in the room who is just drunk enought to take you up on your offer. Don’t get me wrong, you all look like you’re having a great time, dressed up in green from head to toe, all decked out in the best collection of plastic, party shop bobbles that $16.95 will get you. You seem to be enjoying yourself as you drunkenly shout “ERIN GO BRA-LESS” around the bar, as if hoping there’s an Erin in the room who is just drunk enough to take you up on your offer. And I’m not going to lie (I’m lying), there have been occasions that I truly wished I could join in. Oh how I’ve tried. But sooner or later I end up sitting next to a person for whom Saint Patrick’s day is nothing more than a green flag to start a session of all day green beer binge drinking, who probably couldn’t find Ireland on the map the other 364 days out of the year. It’s then that my “programming” kicks in and I just have to leave. 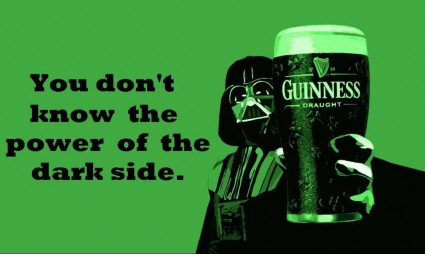 It’s me, not you (unless you’re drinking green beer, then it is definitely you). Brian was to strong of an influence in this aspect of my life. The force was strong with that one. I just can’t break his programming, and because of that I just can’t join you in your merriment. No, I’ll be celebrating as normal, with a crock pot of Guinness, lamb stew simmering as everything from traditional (The Chieftans) to non-traditional (Drop Kick Murphy’s) music plays throughout my house. The family will be together, Guinness and Murphy’s will be enjoyed, and at the end of the day I’ll be sitting comfortably on the couch as I watch The Quiet Man. Good post, and I wholeheartedly agree with you. I’ve been on both sides of the St. P.’s Day revelry. When suckered in to go out with the drinking buddies back in the day, it was just drunken debauchery grimacing down green beers. But for 20 years after that, the Wife and I had never missed the parade here in Denver, and then seeking out the pipers and traditional Celtic live music wherever we could find it. But the plastic bedecked schmos (good picture of the type, by the way) have nearly overwhelmed any enjoyment we once had. Last year we went to a brewery and spent a relatively quiet day sipping pints, which we’ll probably do something similar this year.